Did you hear the happy news? Baby Boy Seewald arrived early this morning! Click here for more details. PEOPLE and TLC still have the exclusive on the first photo of the Seewalds' bundle of joy, but we will post it as soon as we can. Until then, you can view the picture on the Seewalds' website. Jessa and Ben have not yet settled on a name. Do we have a name? Congrats Jessa and Ben! Your baby boy looks very healthy. I am happy for you both! What??? You are up and walking around? Oh my! What and incredible mother/wife are you! Congratulations! He is so adorable! God bless your family. I'm sooooooooooo HAPPY FOR YOU! Y'all are gonna have a awesome big family! I will pray for y'all! Have an awesome time with your little guys! Congratulations on your new Beautiful baby boy Praying for Health and Happiness for your great Family of 4 God Bless. Congratulations on your sweet new addition. God has blessed you. He's adorable. Can't wait to hear what name Jessa & Ben have picked out. Oh what a cutie! Congratulations! So excited for the Seewald family! What a perfect addition to their darling family. Every blessing to the Duggar clan that is still counting on! Have Ben and Jessa picked a name for their new baby yet? Congratulations Ben, Jessa and big brother Spurgeon. What a blessing you have been given today. May God bless and keep you safe. Congratulations and God Bless. Love watching you all! Aw, he's precious! Congratulations, Jessa and Ben! Congrats! 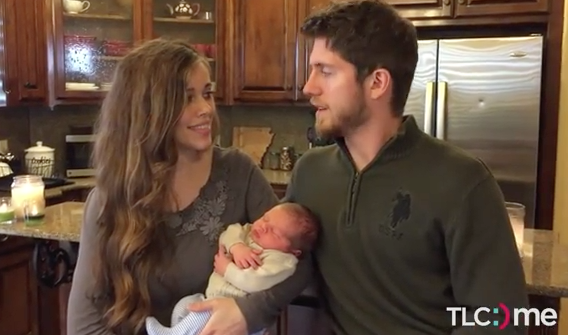 I pray that Jessa and baby are able to have a smooth and quick recovery! May they both be strong, healthy, and blessed! I agree with you!!! Congratulations Seewalds! Y'all are gonna have a big AWESOME family! Can't wait to see what the name is! I pray for y'all!! Y'all are so blessed! Looks like it's going to be boys, boys, boys! Derick and Jill are expecting another son as well. Congrats to all! According to the caption that is Spurgeon. Pics of new baby Seewald? Congratulations to Jessa,Ben and Spurgeon. Happy everything went well. God Bless.